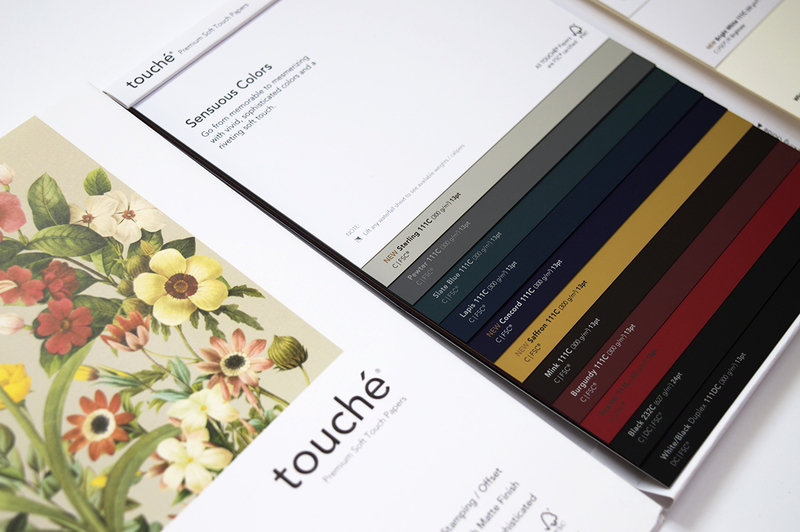 Touché Papers are soft, matte finish papers with a touch of elegance and sophistication. Once you run fingers over its surface, I dare you to try and stop touching it. 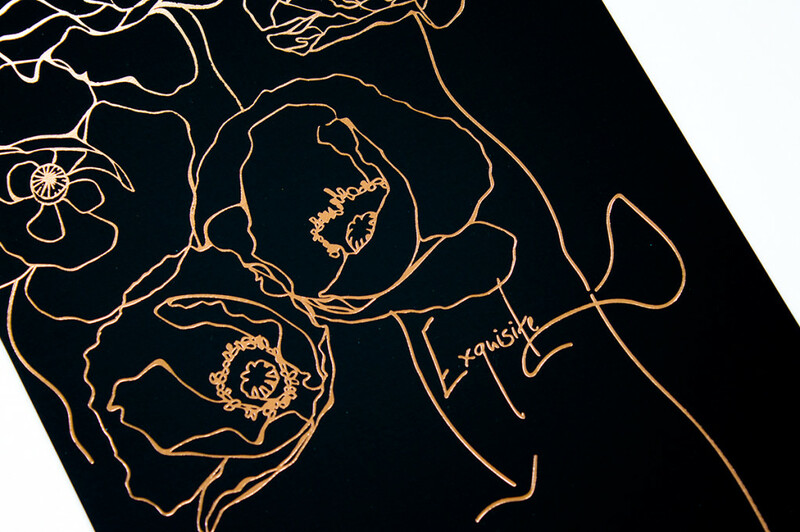 The soft touch hand of Touché lends itself beautifully to print design featuring pressure-based techniques like foil stamping, embossing and engraving. Because the paper is so luxurious in feel it doesn’t require a ton of bells and whistles to make a lasting impression. Touché is perfect for packaging applications. All it takes is one touch to hook you – think hangtags, boxes, bags, etc. But Touché isn’t just for packaging. Made in 13 Pt. & 24 PT. thickness (111C & 232C respectively), it is a solid colored, two-sided sheet. So it is a perfect choice for a project where edges will be visible – like the cover of a catalog. And the fact that the soft-touch finish is on both sides means you get that petal-like feel on the front and back of the sheet. Think about the impression made on a client when handing them a business card produced on Touché. Neenah is known for producing gorgeous papers full of color and texture. And Touché Papers is no exception. Not only is the finish addictively tactile, but the grade offers a range of deep, rich, saturated colors. With thirteen colors in the palette, including the new Sterling, Concord, Saffron and Bright White, there’s a shade suitable for every brand. We all know black conveys a sense of luxury but when paired with the soft touch finish of Touché Papers, it becomes covetable. Oh, did we mention there’s even a White/Black duplex option? I am smitten with this palette and so appreciate the fact that Neenah has added Bright White to the offering. So designers specifying bright white papers for brand identity systems have the option of a soft-touch offering in the shade as well, providing a cohesive visual identity across both print and packaging elements. If you’ve been following P&P, you know I am a huge proponent of using paper to help convey brand messaging. When we talk about branding, the use of a soft-touch sheet like Touché Papers subtly reinforces a message of luxury and elegance – important traits for premium brands. 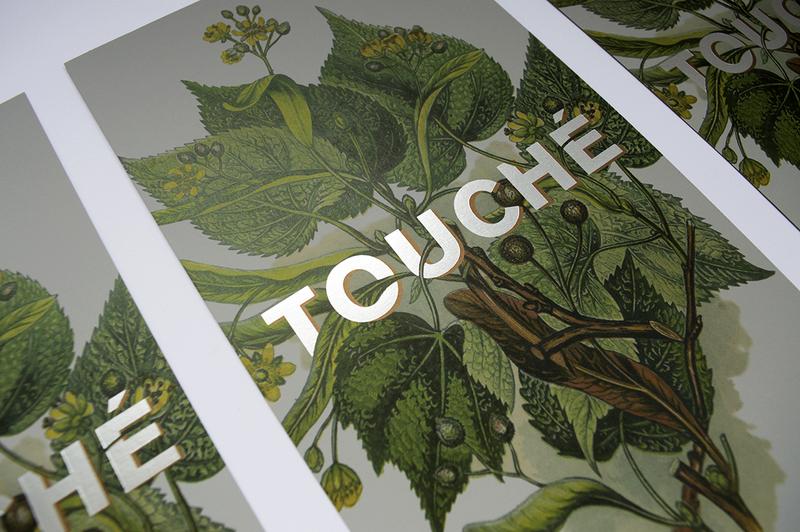 Touché is made to perform well whether its printed offset, embossed, debossed, foil stamped or engraved – or any combination thereof. The one thing about soft-touch papers to consider is that when printing offset, the tactile feel is compromised in the areas where there is heavy ink coverage. So my advice is to use ink thoughtfully on these papers and avoid areas of large solids. But with such a wide range of colors offered, why would you need heavy solid areas? Here’s a teaser for all you P&P subscribers, we’re in the midst now of working on a project using Touché Papers that will be featured in the winter issue of The Parcel – you’re not gonna want to miss this one. When it comes to utilizing a soft-touch finish there is a difference between using a paper and using a coating. Both have advantages depending on the job and desired outcome. Soft-touch papers are great for packaging, the tactile finish is manufactured into the paper, making it suitable for scoring and folding. Not all soft-touch coatings are advisable for packaging applications. When I produced The Swatchbox I asked my packaging printer about using a soft touch laminate. I wanted that really lush, tactile feel and a soft-touch paper in the color/weight I needed did not exist. He advised against it. And while a soft-touch aqueous coating may have worked, it does not give the same luxe feel as the soft-touch paper. And I don’t know about you, but if I’m going for an effect I want to feel it. The other consideration is that most of the time a soft-touch coating is done by flood printing a white sheet with ink and applying the coating. This may be less expensive depending on the design but keep in mind you will see the white edge if exposed. Whereas soft-touch papers are manufactured with dye, so the color is uniform throughout the sheet. This is especially important when edges are exposed. 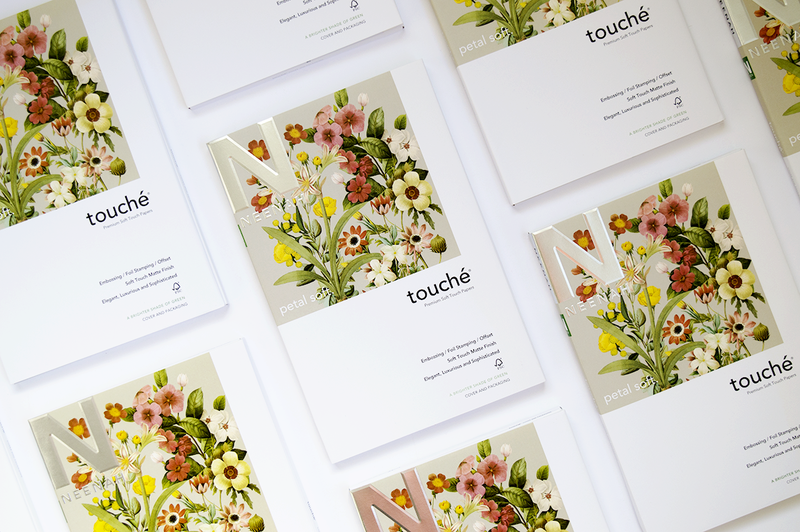 Pssst – we’re featuring the new Touché Papers swatch book in the upcoming shipment of The Parcel, so subscribers keep your eyes open for that. And if you’re not a subscriber but interested in getting a copy for yourself, we might be able to help. Check out our fb live for a closer look at the new Touché Papers swatch book from Neenah.